The week spanning January and February, 2013, featured an unusual variety of events which prompted the following report by David, taking followers of this blog along for a one-of-a-kind week in the life of a touring musician. Without a doubt, one of the things I enjoy most about being a musician is the endless variety of touring experiences. Almost every tour is different, some more than others, and this week was one of the most unusual I have ever experienced. 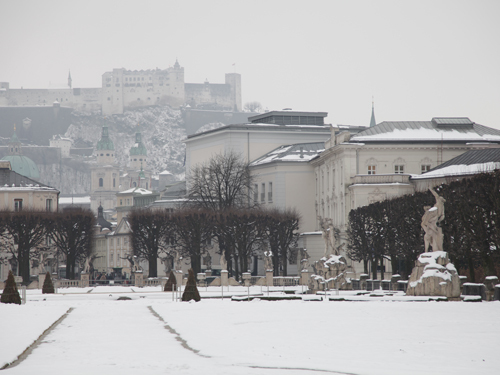 To set the week in proper perspective, I’ll rewind a bit to Friday the 25th, to my concert with the Emerson Quartet in Salzburg’s famous Mozarteum. Part of the annual Mozartwoche festival, the concert gave us the opportunity to collaborate with our longtime colleague and mentor, pianist Menahem Pressler, in both Mozart Piano Quartets. 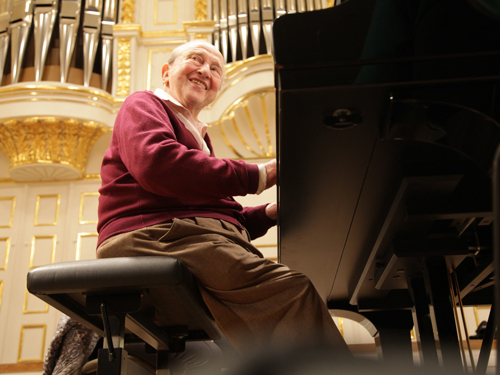 Menahem, at 89, is going strong, and left soon after our performance for a recital in the large hall at Vienna’s Musikverein. 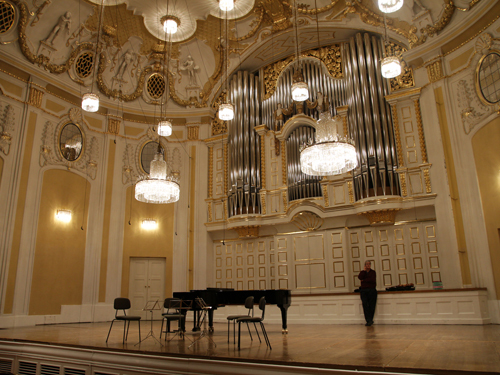 The experience of playing those works alongside a master musician, only a block or so from Mozart’s home in Salzburg, was truly unforgettable. 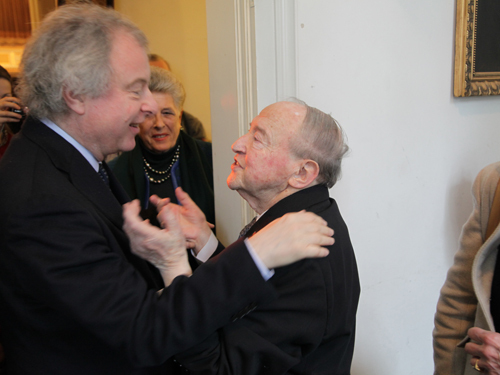 Andras Schiff greets Menahem Pressler backstage following the concert. In a truly rare occasion, I bypassed New York the next day, connecting all the way to Minneapolis, meeting up with Wu Han along the way. Why the rush? We had a duo recital the very next afternoon at the Music in the Park series, where we have appeared many times. We were greeted in St. Paul by the warmth of the St. Paul Hotel, the Ice Carnival in the square outside, and a delicious dinner at the St. Paul grill hosted by our friends from American Public Media. The hotel, the meal, and the company have been part of a long tradition for us, dating back to our first appearances on the legendary radio program “St. Paul Sunday”, hosted by Bill McGlaughlin. Music in the Park is an organization with a distinguished history, leading all the back to its founding by Artistic Director Julie Himmelstrup in 1978. In 2010 the series merged with its fellow Twin Cities presenter, The Schubert Club, a similarly distinguished organization that dates way back to 1882. The merger allows Julie to concentrate on her artistic planning while the Schubert Club handles logistics. Be that as it may, Julie was still the last one out of the church after the concert, locking up herself. Julie Himmelstrup is a member of America’s elite society of individual presenters, whose passion, intelligence, insistence on quality, courage and vision have propelled the series ever forward. 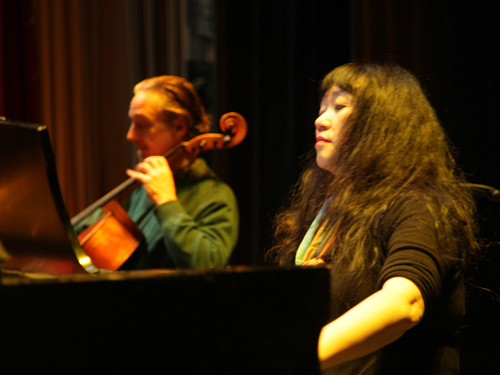 Her presence is felt throughout, and as Wu Han said, her audience of 500 friends shows up faithfully to hear the artists and programs she brings to St. Paul. 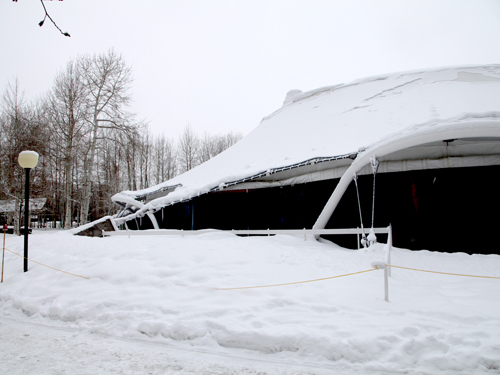 Sunday afternoon’s concert was accompanied by a snowstorm that left a hefty 8 inches of snow on the roads. Nevertheless, Julie’s audience was undeterred, and the church was completely packed. 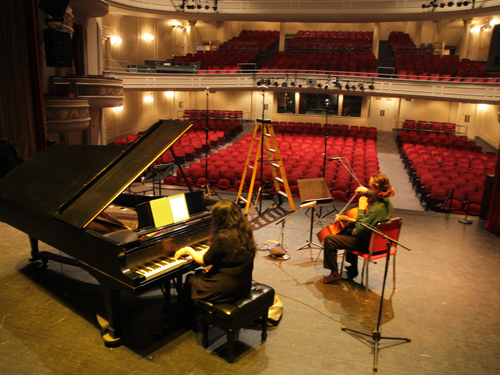 We played on of our “unfolding” program for them, consisting of Beethoven’s Sonata Op. 5 No. 2 (1796), Brahms Sonata No. 1 (1865), the Debussy Sonata (1915), and the Britten Sonata (1960). Fueling the Twin Cities’s current hunger for music, undoubtedly, are the twin lockouts of both the Minnesota Orchestra and the St. Paul Chamber Orchestra. ArtistLed’s former longtime employee, Patrick Castillo, is waiting out the dispute, as is violinist Erin Keefe of CMS and Music@Menlo fame, who only last year assumed the position of concertmaster at the Minnesota Orchestra, succeeding the legendary Jorja Fleezanis. Both of these faithful friends and colleagues showed up at our performance. 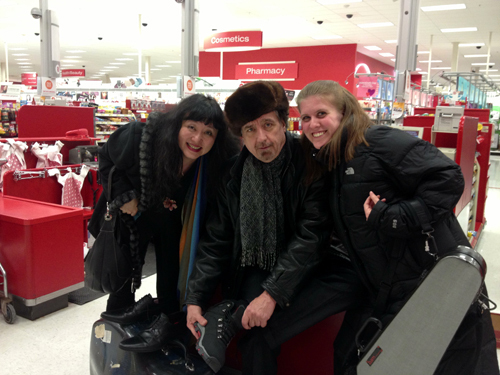 After a delicious and delightful reception in the company of board members of both organizations and Barry Kempton, the executive and artistic director of the Schubert Club, we boarded Erin Keefe’s car for an unusual post-concert destination: the nearby Super Target, in search of snow boots for me. Fortunately, we were successful, and for good reason, as you will soon read. Before our departure the next afternoon, we had the pleasure, once again, of taping a performance and interview with American Public Media, to be broadcast on the Performance Today show (check your local American Public Media listings for broadcast times on February 14). Our host was Fred Child, whose mellow voice is now one of the most recognized in radio. Fred’s regular hosting appearances also include NPR’s Creators @ Carnegie, among countless others. 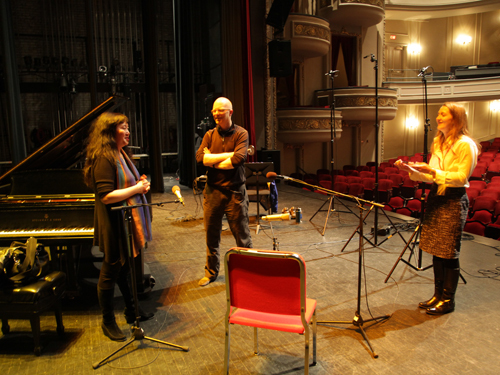 The taping, in St. Paul’s historic Fitzgerald Theater included performances of Brahms, Debussy, and Rachmaninov, as well as discussions on the music and on our diverse activities. 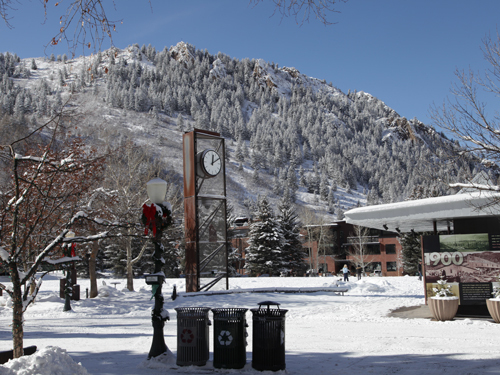 After a quick farewell to our good friends, we headed to the airport for our first flight to Chicago, and then to the winter destination which resides in the dreams of many: Aspen, Colorado. 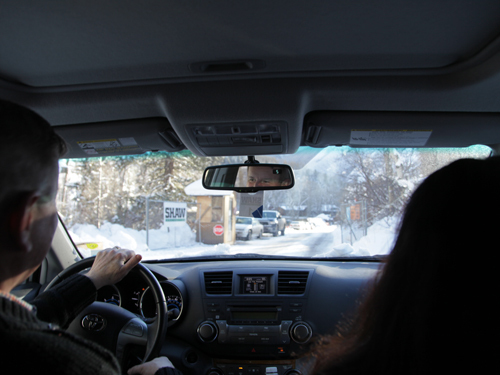 The extraordinary circumstance of our trip to Aspen is entirely the result of the ingenuity and determination of the Executive Director of Aspen Public Radio, Andrew Todd. Spying on our concert schedule via our duo web site (all of our performances are listed there), Andrew determined that I had no concerts between our recital and St. Paul and a quartet appearance in Vancouver one week later. He inquired if we might be available to perform in a benefit for the station during the week, and after determining that all of our business commitments during that week could be fulfilled by phone conference, we agreed to go. 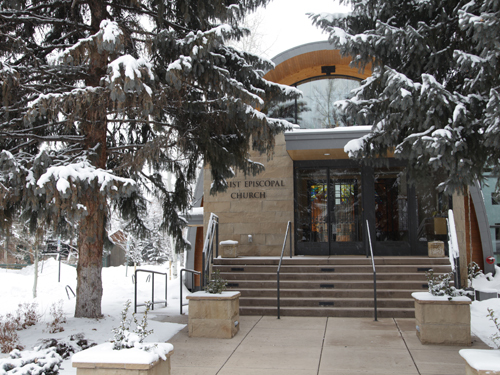 Making all this possible was the hospitality of Aspen Public Radio, which used its good relations in town to make the five-day stay comfortable and productive, among them, our favorite summer accommodation The Aspen Alps, and the Christ Episcopal Church, where Wu Han had flexible practice hours at her disposal. 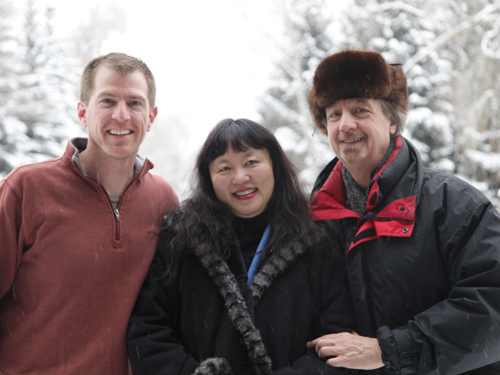 Soon after our arrival, we met Andrew Todd at the radio station to tape an extended interview, during which we spoke of course of our long history at Aspen, and, very excitedly, of our coming chamber music program at the festival this summer (stay tuned). Andrew is the most engaging of hosts: energetic, articulate, informed and passionate about music. He was an accomplished piano student of the late Herbert Stessin at the festival during the 1990’s. The next evening, we performed for an audience of seventy-five at an extraordinarily beautiful home on Aspen’s Red Mountain. Playing both the Strauss and Brahms E minor sonatas, we talked not only about the music but about our long history with, and support from, Aspen Public Radio. It was a tremendously rewarding experience, and a great opportunity to provide some support for an institution both expertly-run and committed to quality programming. After the performance, we enjoyed an intimate dinner with close Aspen and Chicago friends, the authors Judith Barnard and Michael Fain, in their home. 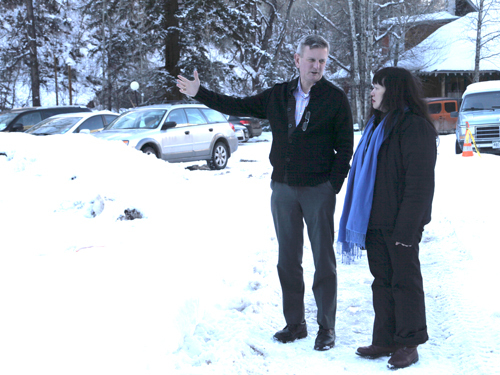 The following day included both a dinner, hosted by Aspen Music Festival board member Mike Murray, and a late afternoon tour of the festival’s school campus. The site is undergoing a $35 million construction, which includes new buildings for practice, rehearsal, and administration. 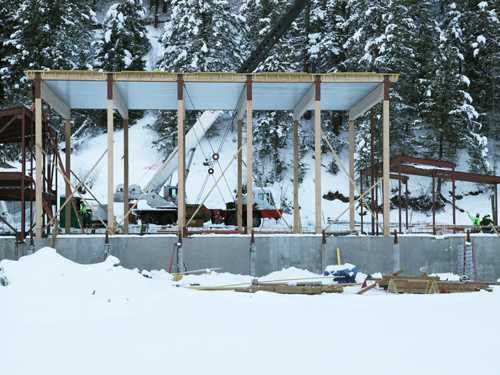 It is the most ambitious construction project for the festival since the construction of the Joan and Irving Harris Concert Hall in 1993, and it was a further pleasure (an something of an honor) to be guided through the almost-unrecognizable school, where we have taught for almost thirty years, by Aspen Music Festival president and CEO Alan Fletcher. 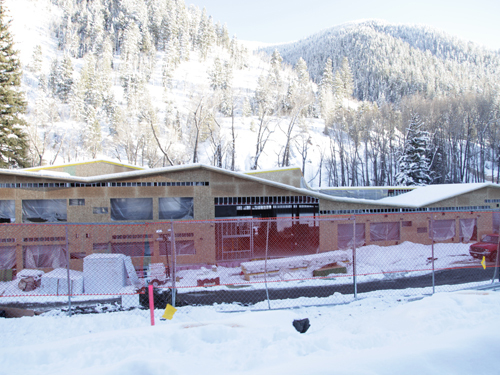 Alan Fletcher gives us a tour of the new Aspen Music Festival campus. We also had the excitement of a planning session for our coming chamber music workshop this summer with Vice President and Dean of Students Jennifer Johnston. 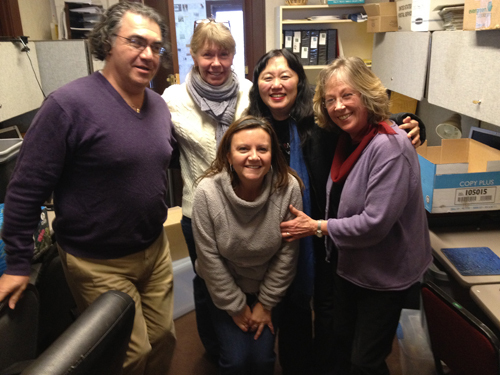 Coming out to give us warm greetings were, left to right Asadour Santourian, Mary Rechlitz, Deborah Barnekow to the right of Wu Han, and Jennifer Johnston in the front. And now: a departure for this music-based blog. 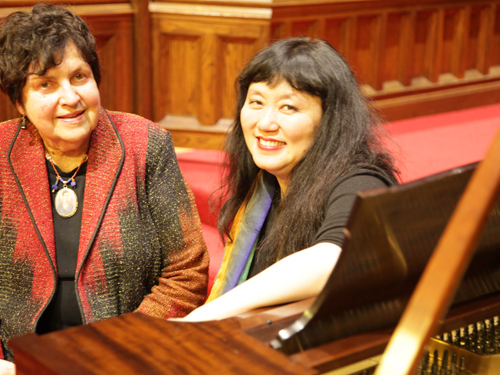 While Wu Han and I are determined to use this outlet to share experiences we consider worthy of the time of those interested in the arts, we have to acknowledge that there is a certain amount of curiosity out there about our non-musical activities. Our experiences during Friday and Saturday were completely unprecedented, and, as they can be accompanied by stunning visual documentation, I’ll describe them here. Musicians possess varying amounts of both free time and athletic skill. Wu Han and I have very little of either. 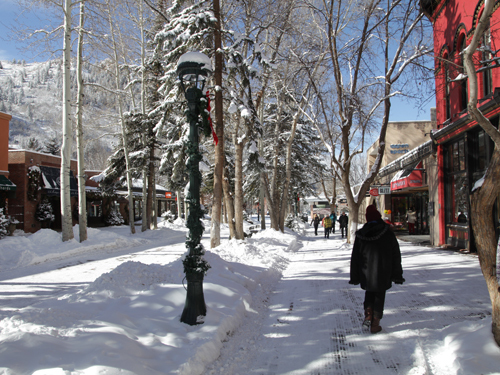 But that did not prevent us from seizing the opportunity to partake in, during Thursday and Friday, Aspen’s most famous winter activity: skiing. 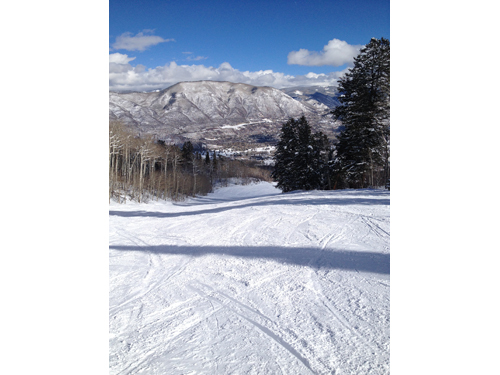 Aspen is truly blessed with a wide selection of ski areas within a few mile radius: Ajax or Aspen Mountain, Buttermilk, the Highlands, Tiehack, and nearby Snowmass. 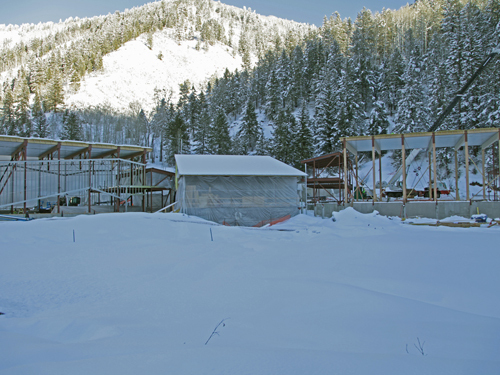 For our once-in-a-lifetime chance to experience skiing at its best, we were advised by Emerson Quartet ski fanatic Larry Dutton to choose Buttermilk, the ideal area for beginners, and he could not have been more right. For this historic exploit, Wu Han and I were blessed in all ways: with a kind, gentle and phenomenally gifted private instructor, Ned Ryerson; with the unbelievably beautiful Buttermilk ski area; three days of fresh snow which ended just before our lessons began; perfect temperature, sunshine and calm winds; very few others on the mountain; and two luxurious six-hour ski sessions that included instruction, gourmet lunches atop the mountain, and, for me, at several solo runs from top to bottom on various intermediate trails. 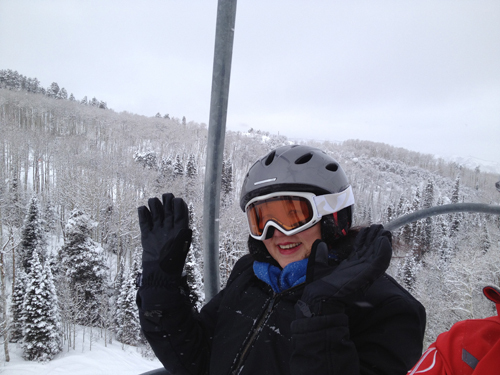 Although I had learned to ski in my early teens through the Far Brook School winter program in New Hampshire, I had only skied once since in the mid-1980’s. 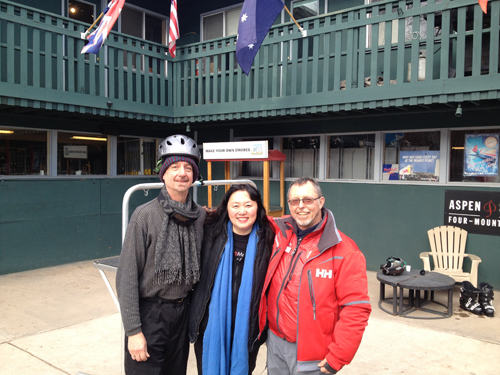 I was somewhat terrified but did not show it because Wu Han, who had never skied, was more than terrified. It took a tremendous amount of determination to pull this off: although I reserved our instructor by phone days in advance, I had very little idea what I was doing. But it seems the very nice people at the ski area, and in the equipment and clothing shops, had all encountered novices like me, and made it all seem simple. Equipment has changed a lot since the last time I was on the slopes, and the new skis – shorter and with curved sides, copied from snowboard design – gave me more control than I could ever remember. With a few helpful pointers and a good dose of mental training from Ned, I got going much faster than I had anticipated, and Wu Han, for whom, as Ned put, we had “low expectations but high hopes”, looked very natural after a short time, and was skiing solo by lunch. Check it out! You are the first to see Wu Han ski. We credit Ned with Wu Han’s amazing progress. 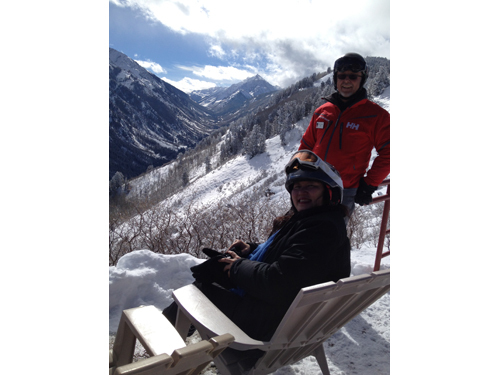 He was a completely supportive instructor, full of knowledge, insight, history, and of course, skied with inspiring ease and beauty. Our visit concluded with a delicious dinner at Aspen’s famous restaurant Cache-Cache, with our close friends Sarah and Marty Flug. 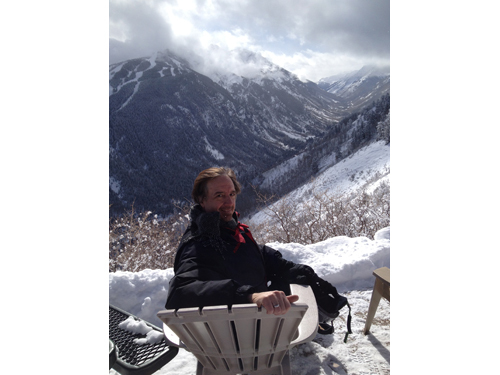 Marty has been a vital supporter of the Aspen Music Festival for as long as we have been there, and has directly sponsored many of our duo recitals. It was a joyful way to cap off five days of rejuvenating experiences. 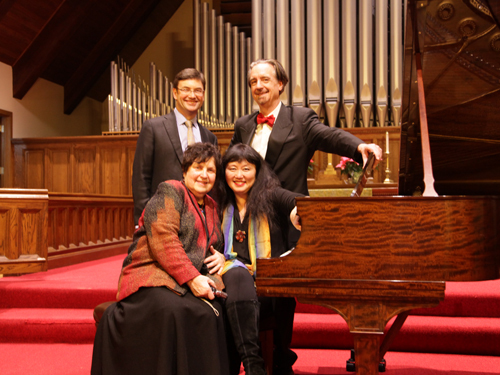 On Saturday we split up, Wu Han heading east to New York and me to Vancouver where I joined up with the Emerson Quartet. It was my final appearance for the Vancouver Friends of Chamber Music and its amazing organizer, Eric Wilson. Unfortunately, I had to forego the traditional post-concert dinner, always at a different and fantastic restaurant, as I just barely made my 7:30 pm flight to San Francisco with a continuing redeye to New York. On Monday evening, it was time to officially unveil the 2013-14 CMS season.